"The kids had an absolute blast making these cookies... We all enjoyed eating them as well... My 12-year-old son, Zach, suggested that next year we design our own spooky cardboard cut-outs for even "creeepier" cookies.... We'll definitely have to see about that. Either way, I can't wait to see what we come up with!" Materials needed: Assortment of Halloween cookie cutters, clean paint brushes. In a large mixing bowl beat butter with an electric mixer on medium to high speed for 30 seconds. Add sugar, baking powder, and slat. Beat until combined, scraping sides of bowl occasionally. Beat in egg, milk, and vanilla until combined. Beat in as much of the flour as you can with the mixer. Stir in any remaining flour with a wooden spoon. Divide dough in half. If necessary, cover and chill dough about 30 minutes or until easy to handle. On a lightly floured surface, roll half of the dough at a time until 1/8 inch thick. 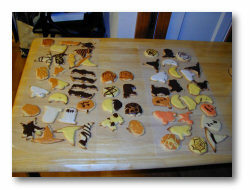 Using a floured 2 1/2-inch cookie cutter, cut into desired shapes. Place 1 inch apart on an ungreased cookie sheet. Bake in a 375 oven for 7 to 8 minutes or until edges are firm and bottoms are very lightly browned. Transfer cookies to a wire rack and let cool. Decorate cookies with Meringue Powder Sugar Icing: let icing dry. Use the paint brushes for fine detail. Meringue Sugar Icing: In a medium mixing bowl beat together 1/4 cup warm water and 2 tablespoons meringue powder with an electric mixer until combined. Beat in 2 3/4 cups sifted powdered sugar to make a smooth, spreadable icing. Separate icing into five equal parts. Tint each batch of icing with an individual food coloring (add food coloring by teaspoon until you achieve the desire color density). Try these Halloween colors: black, orange, yellow, white, and red. Recipe yields about 36 cookies. Meringue powder is a made of dried egg whites, sugar and gum. It can be found in the baking goods section of your local food market.